Prior to my buying into the heathen bargain that is Los Angeles, ye olde Drunkard grew up in the wooded enclave that is Atlanta, GA. Recently, through the magic of eMusic, bit torrent and the like, I have been revisiting albums by ATL artists that I long sold off in the mid-late 90s in an effort to pay off various and sundry bartabs, gambling debts, etc. Earlier this year I looked back at the Jody Grind and Cabbagetown favorites, the Rock*A*Teens. Today I’m picking up the thread with Smoke. Residing somewhere on a plane between fact, fiction and half-remembered anecdotes, expect future entries on other weird and forgotten outsider outfits that haunted the deep South, and Redneck Underground of Atlanta, during the nineties. Similar to my thoughts last Fall—while discussing the Glands s/t LP during the rundown of our Decade series—looking back at a number of these Atlanta projects has found me playing the ‘what if’ game. Specifically, what would/could have happened to some of these albums and artists had they dropped a decade later during the ramp-up of accelerated online culture. Would they have been championed, reaching a wider audience, thus increasing opportunities, or would they have been swept up in the hype-machine maelstrom; devoured and spit out by fly-by-night blogs and self-anointed tastemakers. It’s anyone’s guess, but revisiting these titles now, free of any associated tacked-on residual hype, has only made the listening that much sweeter. Which brings us to Smoke, the band fronted by Benjamin Smoke, born one Robert Curtis Dickerson. Benjamin, who died in 1999 of complications related to Hepatitis C at the age of 39, was a far cry from the safe, pasteurized, ‘indie’ rock figureheads of the past decade. An openly gay sometime drag queen, plagued by a myriad of drug dependency issues, Smoke was alternately known as as “Miss Opal Foxx,” or “Benjamin,” depending on what the mood, and music, called for. Like all great artists he was a chameleon. Smoke’s posthumous myspace page poses the rhetorical question ‘What is the sound of the queer southern blues?‘ That depends, but in this case it is all about the mood—the atmosphere—of what is being played, and more importantly, what is not being played. What is not being said. A casual description might describe Smoke as, say, ‘Tom Waits backed by cello, trumpet, drums, banjo and electric guitar’. But like all descriptions devoid of nuance, such a statement would only begin to scratch the surface. Instead, let me note that two of Smoke’s favorite artists were Nina Simone and, his contemporary, Vic Chesnutt. Two artists whose stock and trade were mood and atmosphere. Heavy, yes, but often countered with a wry sense of humor. 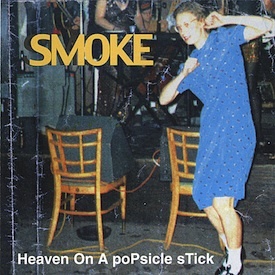 Smoke cut two LPs beginning with Heaven On A Popsicle Stick, in 1994. A harrowing, thirteen song, gothic trek through a southern underground as equally informed by the ethos of punk as the regional traditions of country, blues, jazz and folk, Popsicle is a genre classic. Haunting and beautiful, listening to the album now feels like a postcard from the recent distant past. A snapshot of and time and place long gone, never to be repeated. Elsewhere: For a closer look at Smoke, beyond the music, check out documentary filmmaker Jem Cohen’s film Benjamin Smoke. Cohen spent 10 years documenting the artist prior to his death. The DVDs extras include covers by Cat Power and Vic Chestnutt. Are you going to do any coverage of the might FLAP? i meant, the mighty FLAP. Oops. Wow, sounds amazing. I have never heard of this guy. I will be tracking this album down immediately. Thanks for the post. Haven’t heard this before. Great voice, music and lyrics. Nice grit, too. This man’s music is so good. It’s just so right. I wish he were alive but thanks to people who keep spreading the word his music and spirit still floats around out in cyberspace and sometimes it finds people who it needs to find. I needed it to find me. I feel happy for the next person who it finds because it really fills a gaping hole in a wounded heart, and sometimes a person really needs that to keep going. Saw Smoke many times. Their lives shows were – for the most part – a total mess (mostly due to Benjamin’s impairment.) Yet what they were doing was so good it rose above the performance’s faults. And it was obvious to me – as it was to Patti Smith – that one was watching “Death Singing.” Majestic and tragic at the same time.